Olight’s SR51 Intimidator flashlight is a little confusing. 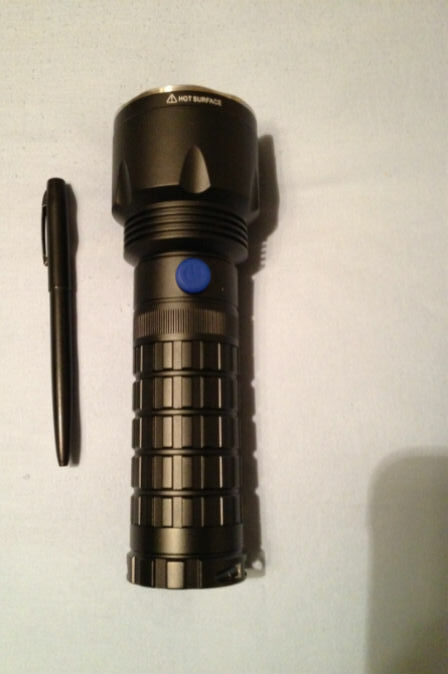 Because, despite the name, it is NOT a tactical flashlight. It’s one hell of a general purpose light, though. First I’ll list the good things about the Intimidator. Most important thing on the list: this light is bright. One hundred lumens brighter than Surefire’s M3LT. Before turning it on you have to check the earth and moon’s alignment so you don’t accidentally cause an eclipse. I’ve owned plenty of police and military tactical lights, and don’t think I’ve ever had one nearly this bright. The SR51 Intimidator has two brightness levels (two hundred fifty and nine-freakin’ hundred lumens), and easily switches between them by holding down the power button. 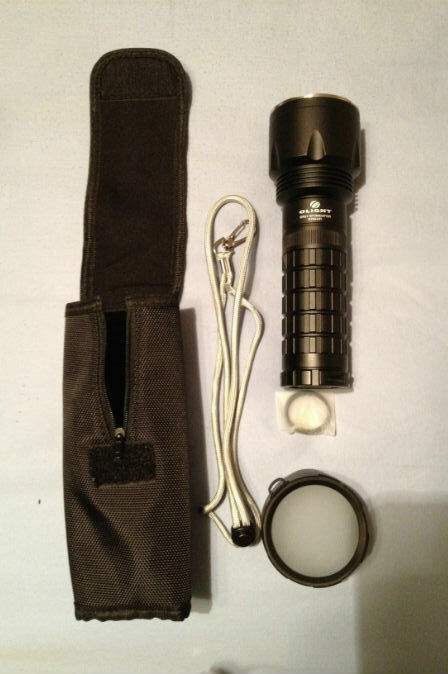 Two quick clicks on the button switches the light into strobe mode (which defaults to the high-power setting). Low power, high power and strobe; what more do you need from a light? And you don’t need an engineering degree to program it. It’s a simple system. Another super cool thing about the Intimidator is its presentation. It comes in an attractive metal lockbox with precise foam fittings, complete with belt case, wrist lanyard, extra o-rings and light-diffusing lens cap. The flashlight itself is beautifully finished in dark black with crisp silver lettering. It just looks like a good light. According to Olight’s website, the Intimidator is waterproof to two meters, impact resistant from almost five foot drops, runs for ten hours at low power and one hour fifty minutes on high power. And it’s all contained in an aircraft-grade aluminum housing that’s 7.5 inches long and 14 ounces. Pretty impressive. 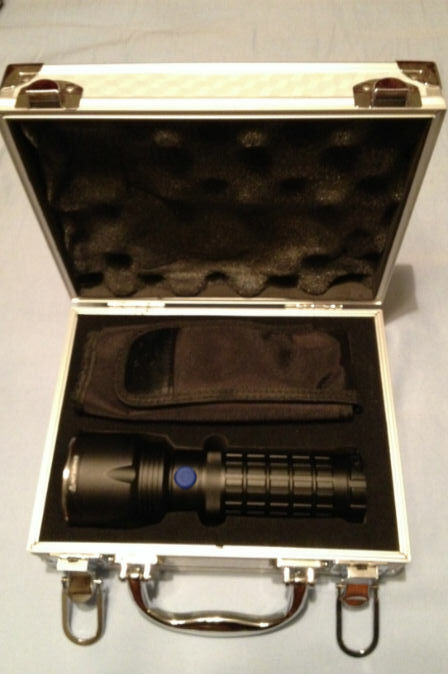 Wow, when a flashlight comes in its own case you know it is a serious light! 900 lumens is pretty bright for a hand held flashlight.